TVs must have HDMI inputs! 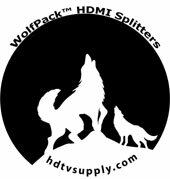 HDTV Supplys WolfPack™ HDMI to Coax Splitter extends a single HDMI video and stereo audio signal to dozens of widescreens over a signal point-to-point coax cable to TVs that can be 1,500 feet away that have an HDMI input, not coax. The HDMI Extender Over Coax provides digital coding processing for HDMI signal with our DTV technology. The HDMI to Coax Splitter adopts our RF modulation technology to transmit the one HDMI signal up to 80 - TVs via a coaxial cable per the TVs HDMI input. No fiber and no special training required as well as you don't have the limitations on distance like you find in HDMI cabling and HD-SDI systems. By adding the above DTV network mixers (coax splitters) attached in line with the RF cable you can achieve many different kinds of transmission modes like similar to an HDMI splitter operating over 1,500 feet. For example you could configure a 1x25 HDMI splitter for one PC going to 25 widescreens up to 1,500 feet away by wiring one coax cable per TV. Contains one transmitter (TX) and any number of receivers you pick plus their AC adapters. The transmission distance up to 500 meters by SYV-75-5 coaxial cable without the need of amplification. Supports 80 channels for option with frequency ranges of 139MHz to 950MHz. The coax bi-directional splitters provide a 1 GHz bandwidth and are ideal for this application. Comes in various number of outputs, see the above Options. NOTE: These high powered units are designed to send an HDMI signal upwards of 1,500 feet so you will need to select a high channel like 80 and maybe use attenuators on the transmitters. We suggest you use 20db or 30db (adjustable) attenuators if your application is to transmit below 100m. Why not buy this HDMI to Coax Splitter today? Our HDMI to Coax Splitter offers solutions for noise, space and security concerns, data center control, information distribution, conference room presentation, school and corporate training environments. NOTE 1: This HDMI over coax set includes an HDMI TRANSMITTER unit and multiple HDMI RECEIVERS and all must be used. It cannot work with only one box and needs all boxes. It cannot be used to convert an incoming coax signal to an HDMI signal. Think of it as multiple long HDMI cables. Q: Can I use the existing coax cables in my house? A: Yes, if they are home run cables w/o coax couplers, coax splitters and even wall plates. HDTV Supply includes a 1 Year Limited Warranty on this HDMI to Coax Splitter. The warranty states that (a) its HDMI to Coax Splitter will perform substantially in accordance with the accompanying written materials for a period of 1 year from the date of receipt and (b) that the HDMI to Coax Splitter will be free from defects in materials & workmanship under normal use & service for a period of 1 year. In order to get a warranty replacement for a defective item, HDTV Supplys Support Team will verify the product is eligible for warranty. An RMA number will then be issued. Shipped replacements will be in like new conditions, tested and all components included. HDTV Supply also sells a 3 and 5 Year Extended Warranty for this HDMI to Coax Distribution Set. Please go to Extended Warranties or see the above Options to purchase it.